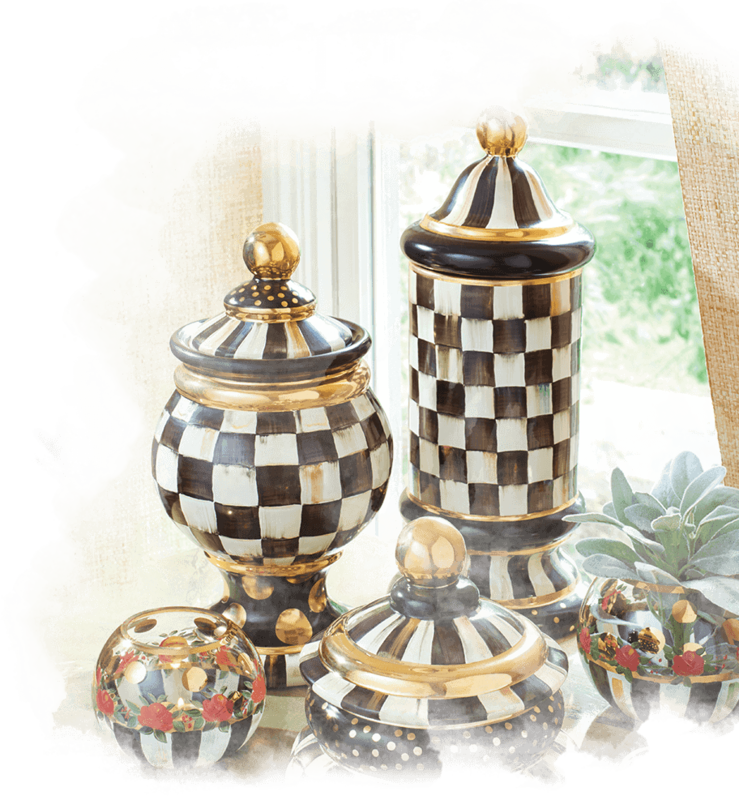 MacKenzie-Childs was born of our love of home and our commitment to fresh, innovative design. Founded in 1983, our humble beginnings started in the basement of Wallcourt Hall, a building built in 1909 as a dormitory for an all-girls prep school. Several years later, we moved to our present-day headquarters just up the road. 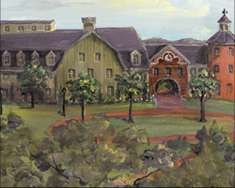 On a tranquil Victorian farm overlooking Cayuga Lake, we produce world-renowned home furnishings. Our designers and artisans have created beautiful products that add joy and grace to homes throughout the world. Colorful, handmade ceramics, enamelware, glassware, furniture, and home accessories define our collection. As you enter the winding brick driveway, you’ll know you are arriving at a very special place. 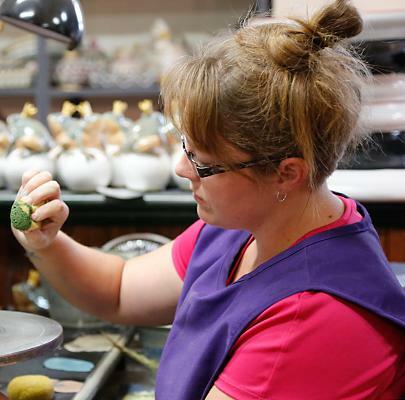 Our dairy barn houses our production studio—where today, handmade, hand decorated majolica pottery, furniture, and home furnishings are crafted by our talented artisans. 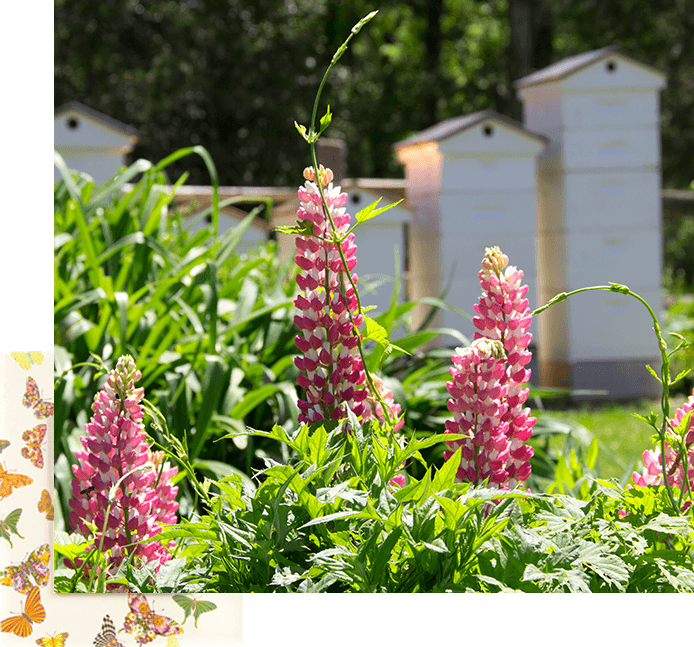 The grounds—open to the public—are home to sprawling gardens, a Second-Empire Farmhouse furnished with MacKenzie-Childs designs that is open for tours, and a retail shop filled with our tableware, home furnishings, and gifts. 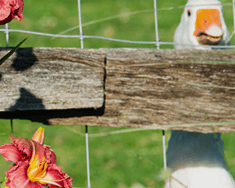 The picturesque farm is also home to a small herd of Scottish Highland cattle, dozens of birds roosting in the Gothic-Revival-style Chicken Palace, a duck pond, a former Cornell horse barn, a 1930s greenhouse, spectacular and ever-changing gardens, and plenty of hay fields. 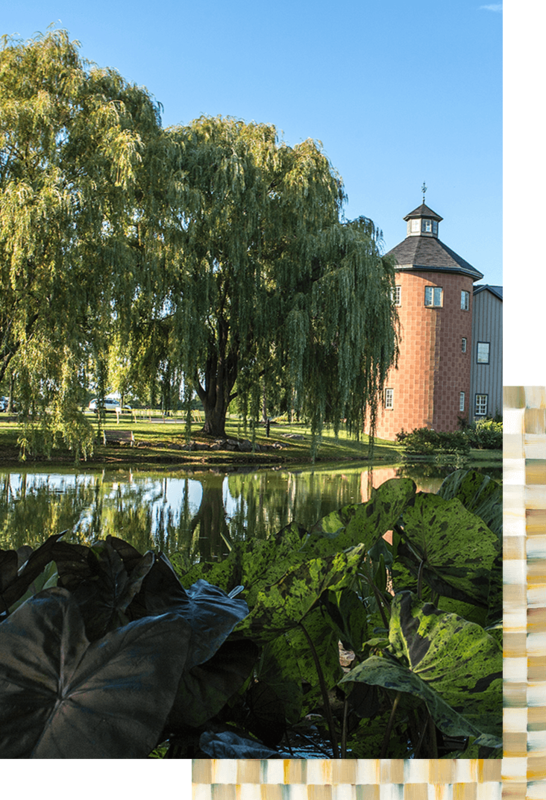 We enjoy the most wonderful views of Cayuga Lake, surrounded by the natural beauty of the rural Finger Lakes region. Overlooking the grounds is our exquisitely restored Farmhouse, showcasing MacKenzie-Childs designs in a variety of traditional interiors. Daily guided tours take you through 15 rooms on three floors, each one a design inspiration. In every season, our magnificent, ever-changing gardens celebrate nature’s grand design. Our serene gardens will have no trouble activating all your senses. We take special pride in our array of blossoms, from tulips and daffodils in the spring, to peonies and lilies in the summer, to mums and asters in the fall. The grounds are open 9:30 am - 6:30 pm daily. Free tours of the Farmhouse (about 40 minutes long) begin in the Shop. Individual reservations are recommended but not required. Reservations are required for groups of 15 or more. Call 315-364-7123, ext. 1282. 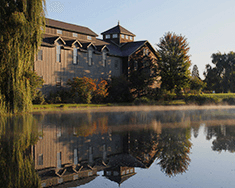 Labor Day through June 5: tours are given daily at 11 am, 1 pm, and 2 pm; June 6 through Labor Day: tours are given daily at 10 am, 11 am, 1 pm, 2 pm, 3 pm, and 4 pm. No 11 am tours on April 16 and May 9, 2019. 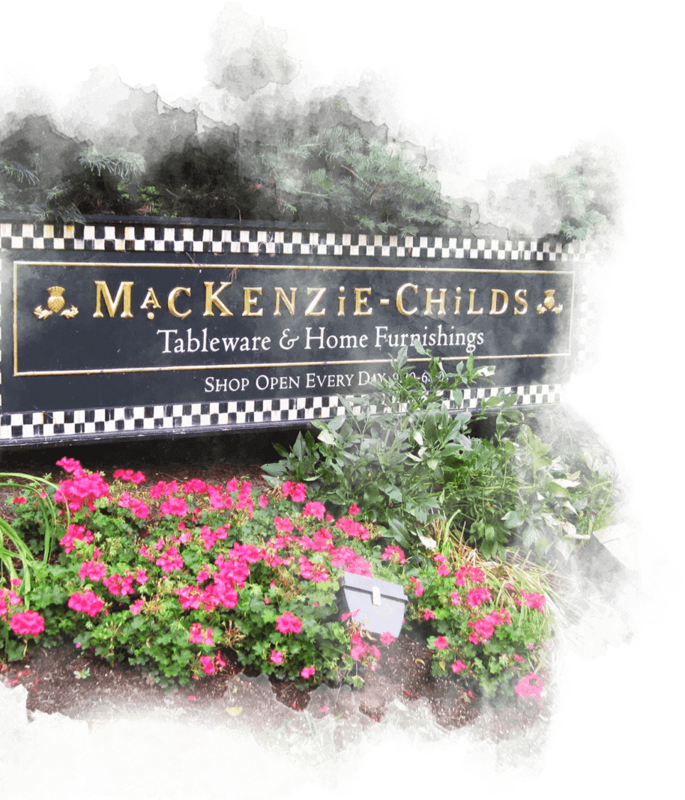 A trip to MacKenzie-Childs wouldn’t be complete without a stop into the Shop. This light-filled and charming store displays the complete line of our products. Serendipities await our avid collectors and new visitors alike. Stunning furniture, lighting, rugs, and tableware will make choosing the hardest part of your visit. Open daily, 10 am - 5 pm (except holidays). From plates to planters, teapots to tureens, MacKenzie-Childs designs are alive with individuality. Each piece created by our artisans holds the surprise and joy of the unexpected. Layer upon layer of artistry applied by hand to every inch of surface is our hallmark. 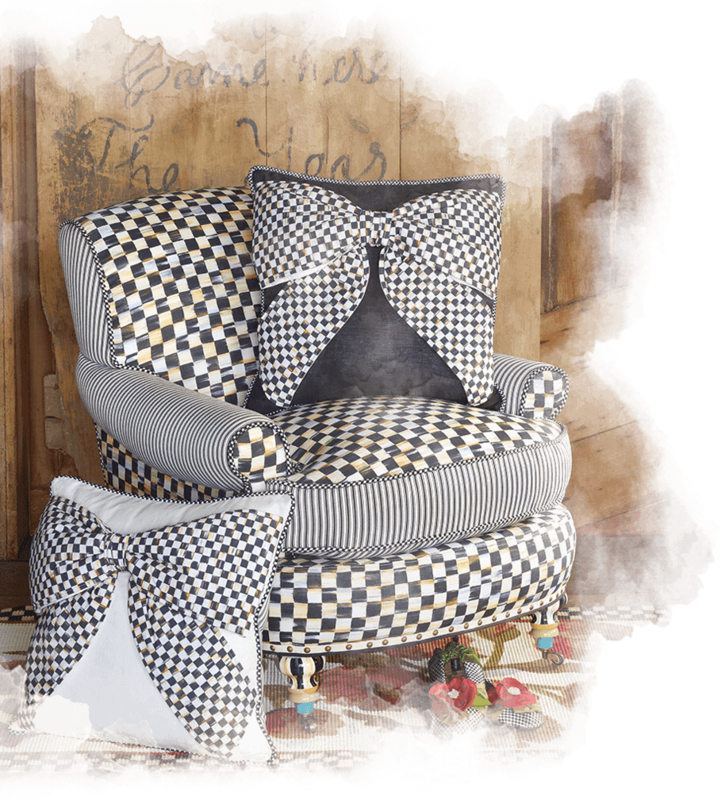 And it's what makes every MacKenzie-Childs creation an original. 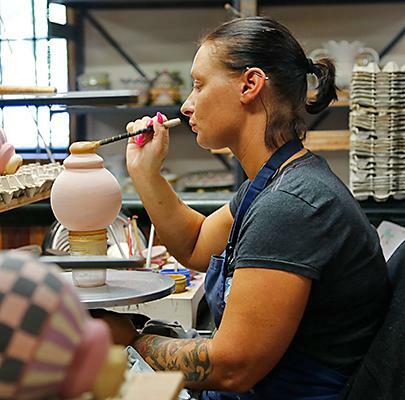 Each handcrafted piece has a unique signature of its own and no two pieces are identical; this is the beauty of our handcrafted ceramics and home furnishings. An artisan's stamp or mark shows his or her contribution to each piece. 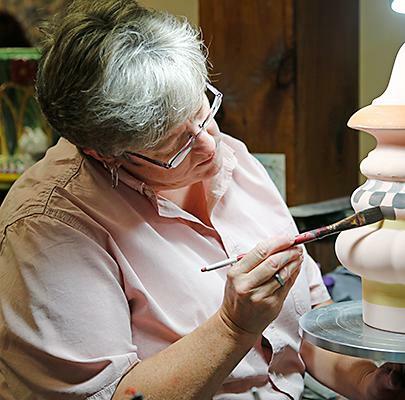 In some cases, the contribution is a stage in the process, as in ceramics. 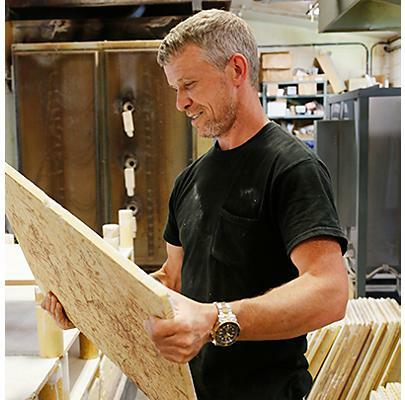 In others, the application of decorative surface treatment may be the start-to-finish responsibility of one artisan. The most important element we work with is not clay or wood or paint. It is our artisans. Their signature individuality is happily evident on every piece that bears their stamps and our name. That evidence of the artisan's hand is what makes each piece a one-of-a kind work of beauty and grace. We invite you to get to know them here. Something special from the start. Our works of functional art are formed using traditional techniques. Although the process takes time, it ensures that every piece is as individual as the wildflowers that grace our meadows. Each piece is hand-painted and no two are exactly alike. 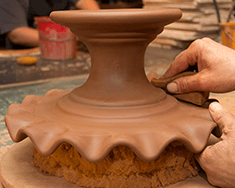 Our pottery decorators mix their own colors, resulting in slight variations. Brush strokes also vary, so you will see the artisan’s “hand” in the work. 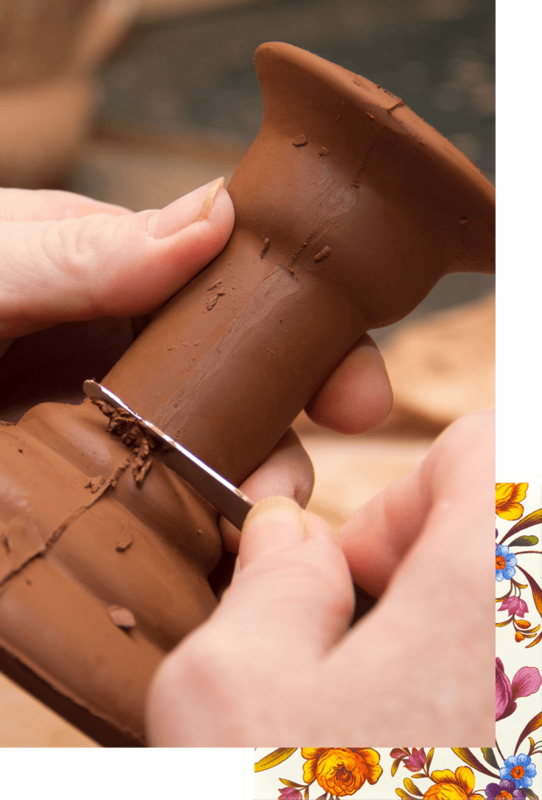 Each piece begins with the most natural and individual of materials: clay. 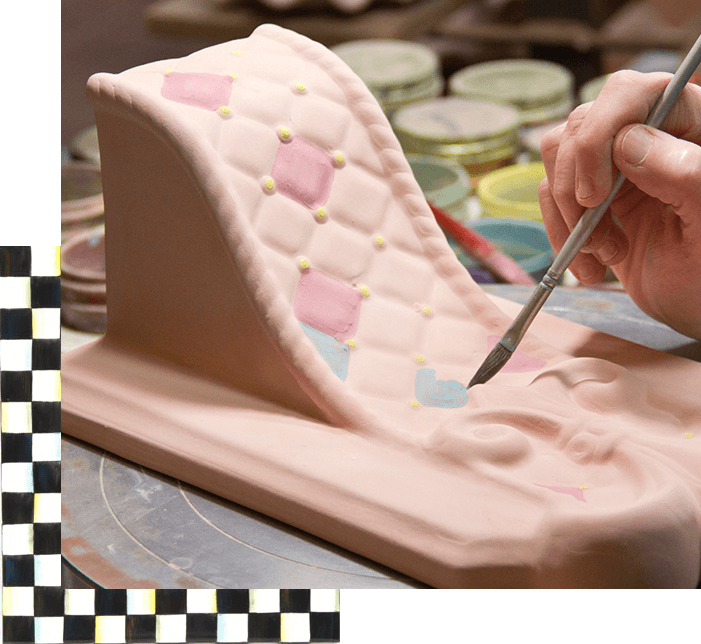 Molded by hand, machine-pressed, or slip cast, the formed clay is fired up to three times, hand-glazed, and decorated. The process is time consuming and takes the special skill of artisans trained in age-old crafts. Perhaps nowhere does our imagination run freer—or manufacturing become more complex—than in furniture. 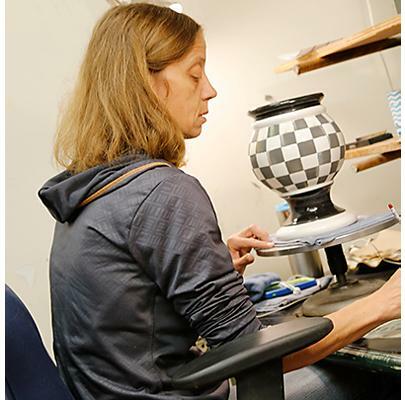 To translate our design fantasies into MacKenzie-Childs products, we seek out the best production partners in the world. Often, happily, these are right here in our Aurora studio. Sometimes, we go further afield in the U.S. or to other countries to find the best-in-class manufacturers to bring our designs to life. 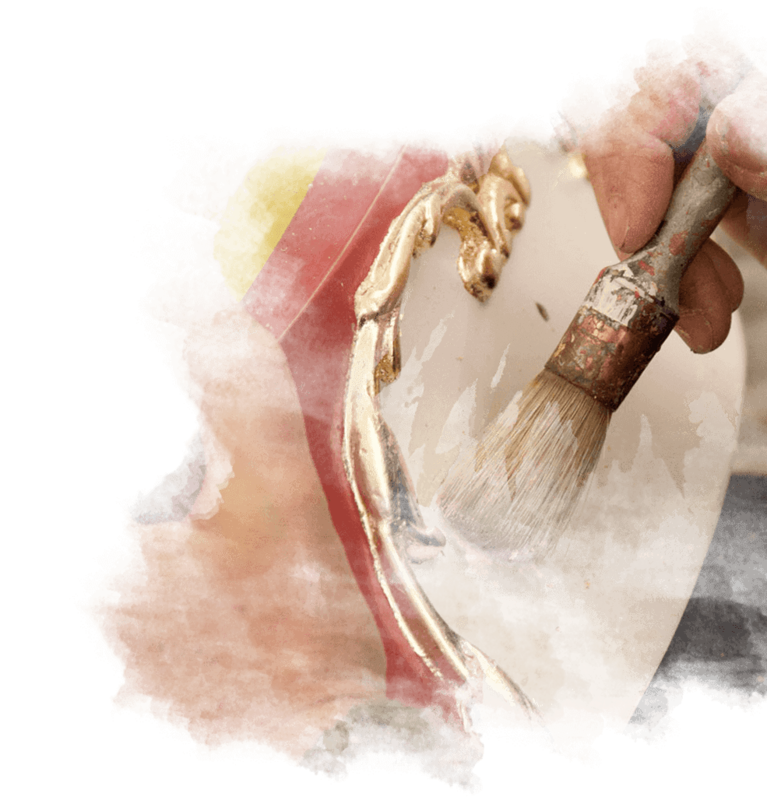 The process of hand-painting furniture and accessories requires concentration, skill, and artist’s eye and hand. Furniture decorators are trained in all painting techniques, and often specialize in one or two. 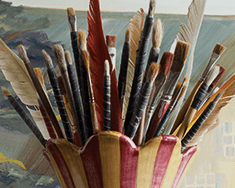 Our furniture is decorated by hand with our signature designs, from painterly landscapes to Courtly Checks, from tiles to dots, decals, and even seashells. Some pieces are created from start to finish by a single artisan. 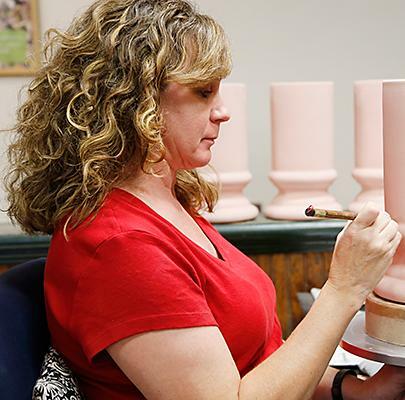 Working from start to finish, a furniture decorator, working with artists' acrylics, gilding, decals, and other decoration may take as much as two weeks to finish one of our larger pieces.